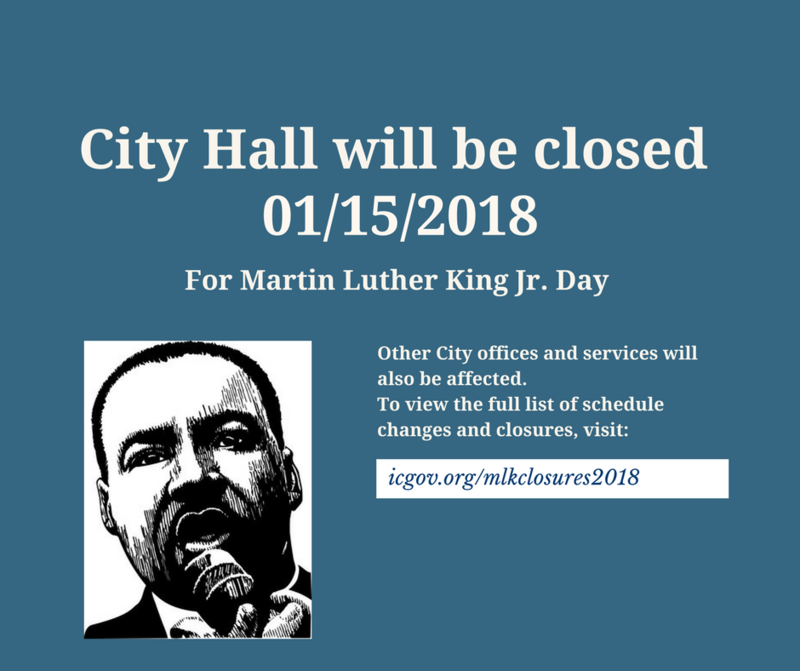 Administrative offices at City Hall will be closed on Monday, Jan. 15, 2018, in observance of Martin Luther King, Jr. Day. The City is partnering with several local organizations to host a series of events to celebrate the life and legacy of Dr. King. To learn more, visit www.icgov.org/mlk2018. Trash & Recycling: Refuse, recycling, and yard waste will not be picked up on Monday. Residents on the Monday route should have their materials at the curb by 7 a.m. on Tuesday, Jan. 16, although the City cannot determine exactly when items will be collected. Transit: On Monday, Iowa City Transit will operate on a regular Saturday schedule from 6 a.m. to 7 p.m. More information at www.icgov.org/transit. City offices and operations will return to normal schedules on Tuesday, Jan. 16.